The most magnificent of all the Tudors - King Henry VIII. Henry was a second son and destined for a life in a church until fate took a hand when his elder bother, Arthur, died. Henry's destiny changed from secular to the monarchy. In his younger days King Henry VIII was a handsome and athletic young man. Intelligent, affable and fun-loving. What happened to change him into an obese, cruel and terrifying monarch? A devout Roman Catholic, awarded the title of Defender of the Faith. He turned the life of the Tudors upside down when he broke from Rome and created the Church of England. Read about the life of King Henry VIII the most fascinating of all the Tudors in each of the following comprehensive sections. Dates of all of the major events and people who were important to the short biography of King Henry VIII. Facts and information about the life and wives of King Henry VIII who played a major part in the life and biography of King Henry VIII. The dynasty of the Tudors include Kings and Queens such as King Henry VIII and his daughters. Basic information about this notorious English King provides a fast and quick overview of this famous monarch. Dates of all of the major events and people who were important to King Henry VIII are detailed in the Henry VIII timeline. Facts and information about the wives of King Henry VIII who played a major part in the life of King Henry VIII, are found in many entries in the timeline. The Henry VIII family tree is in two parts. The first Henry VIII family tree illustrates his immediate family. The second part of the family tree illustrates the ancestors of King Henry VIII, the great Plantagenet dynasty. 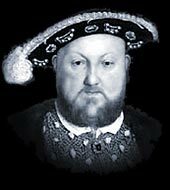 King Henry VIII is famous for his six wives and his cruel behaviour towards them. But the accomplishments of King Henry VIII went much further and covered military, religious, political and personal accomplishments. The most famous quotes by King Henry VIII are about his wives and sum up the relationships in a few short words. Other major events and people are also featured in these King Henry VIII which reflect his views on religion and the Lincoln uprising and his terrifying threats to would-be traitors. Read these King Henry VIII quotes and start to understand the man behind the king. Facts and information about the education of Henry VIII. The subjects he studied and the names of his tutors. Henry VIII was taught a range of different lessons including languages, grammar, theology, history, rhetoric, logic, philosophy, arithmetic, logic, literature, geometry, and music. In addition to all of theses subjects the education of the young Henry VIII also included astronomy, navigation and cartographer and non-academic subjects. Interesting information about the early life of Henry VIII. His family, his studies and the friends of Henry VIII early life. The death of his older brother, Arthur Prince of Wales, ending Henry's position as the second son of King Henry VII. He became heir to the throne of England just a few months before his eleventh birthday. He was no longer expected to take religious vows - he was going to be King of England. This section provides information about his love of music and dance, the Chapel Royal and the assocaition between King Henry, Anne Boleyn and the song Greensleeves. Details of the death of Henry VIII and the illnesses he suffered from throughout his life, the names of the doctors who attended him and a debate of the question of did Henry VIII die of syphilis? Each section of this Tudors website addresses all topics and provides interesting facts and information about King Henry VIII. The Sitemap provides full details of all of the information and facts provided about the fascinating subject of the Tudors!